Yep, it’s finally here. 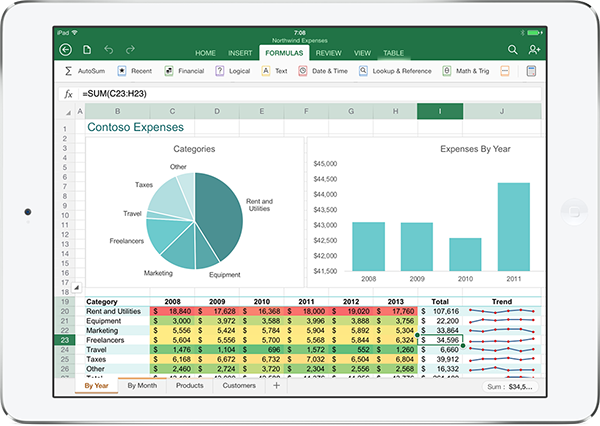 After lots of promises and years of delay, Microsoft has finally released a true Office for iPad suite (no more emulations from third parties). Maybe this move is to counter Apple’s semi-recent decision to bundle its iLife apps (Pages, Numbers and Keynote) for free. Maybe they just finally got around to it. Who knows? But here it is, so I figured I should check out exactly what Microsoft is offering to Apple users. 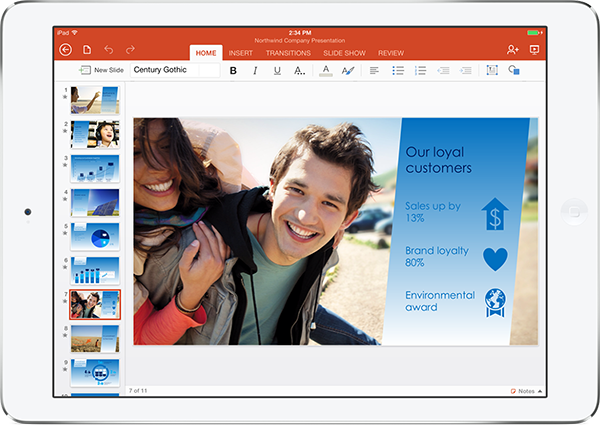 As expected, Office for iPad is a collection of three apps – Word, Excel and Powerpoint, of course, in addition to the previously available Microsoft – iPad offerings. The apps are free, but there is a catch – to do more than view (in other words, to create or edit) docs, you will need the Office 365 subscription, ranging from $6.99 to $9.99 per month for Home Personal or Premium, or one of their business subscriptions. Then, the tablet will have access to the same material available through Office Online, including use of OneDrive for storage. With an Office 365 subscription, you get five tablet set ups and five desktop setups of the suite. The apps for iPad are more robust than one might think – they do look like their desktop counterparts to a degree. Of course, with the emphasis on touch interface. 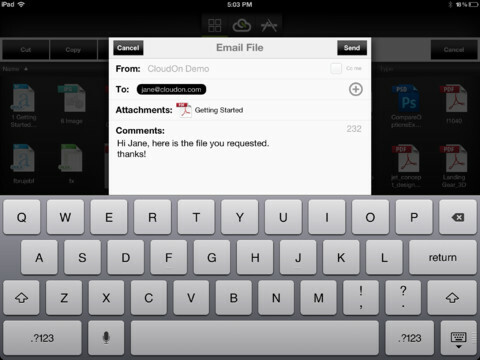 Most common features are included in the iPad version, while more arcane features remain desktop only (for example, you can footnote on the iPad, but forget about Mailings and Reference tools). Manipulating text follows the usual iOS protocols for selecting, cutting, pasting, etc. You can track changes, co-author docs, and spell check (although there is no grammar checking or thesaurus tools). 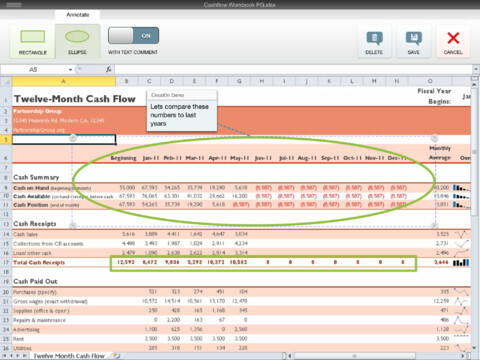 There are 16 templates in Excel for iPad, which should cover most of the scenarios you would need on a mobile basis. For free, you can read, view and present. For a monthly fee, you can create and edit. I would imagine the cost would be justified in the business setting if you are a heavily Office-oriented firm. You can get a 30 day free trial of Office 365, so you can assess whether the new mobile / desktop setup would work well for you. Make sure you are running iOS 7 or later. Oh, and they have versions for your iPhone and Android device as well. Check out the promo video and screenshots below. The apps are nothing if not beautiful to look at. 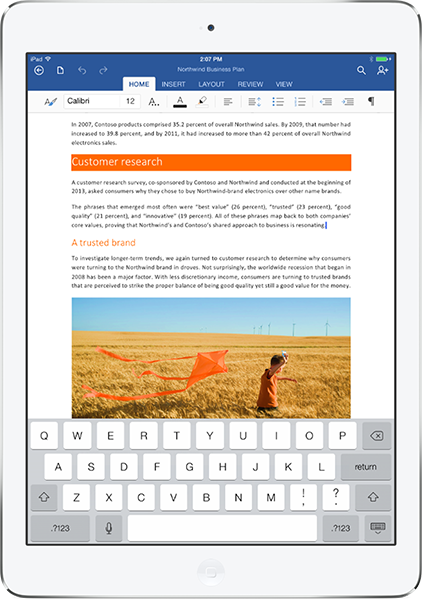 Back in January, Microsoft Office users rejoiced with the introduction of CloudOn, an iPad app that ran a virtualized Microsoft Office suite (Word, Excel & PowerPoint) on the iconic tablet. Not content to sit on their laurels, CloudOn’s developers have added new features to the app that makes it more appealing and useful. 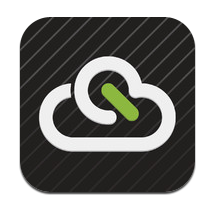 CloudOn 2.5 adds the ability to annotate and track to its iOS app. But don’t worry, Android support is coming. In addition to the previously available tools for managing, creating and editing files, you will be able to add shapes and lines in Word with your fingers, type a note and preserve those markups in the files themselves. You can save to Dropbox, Box, or Google Drive accounts. The new CloudOn FileSpace feature reveals a real-time stream of data on changes to your documents so that you can effectively track changes across platforms. 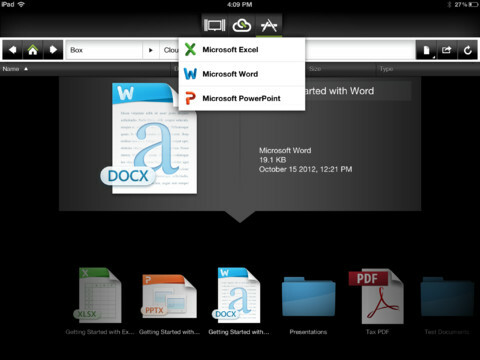 The ribbon toolbar is optimized for touch gestures for editing and spell checking. While it is running a version that is akin to 2010, rather than 2013, it is more than sufficient to give that virtualized Office experience. 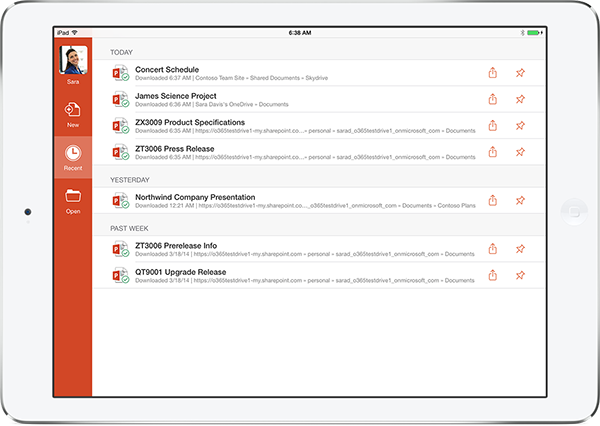 While it’s a bummer that it isn’t yet retina supported, it is a great tool for those longing for Office on their iPad or Android-powered device. It also bears noting that, through partnerships with both Microsoft and Adobe, CloudOn lets you open and view a variety of file types with the built-in Adobe Reader and File Viewer, including PDF, JPG, PNG, GIF, etc. And its all for free. 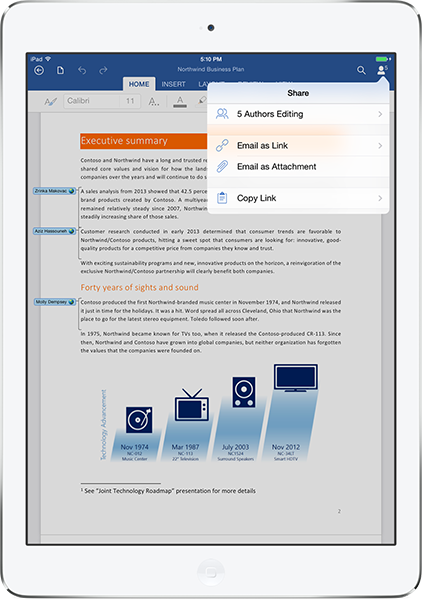 Speaking of presentations, SlideShark, formerly an iPad only app coming from online education purveyor BrainShark, hopes to make the experience of viewing, sharing and projecting PowerPoint files fit in your pocket. It has just released an iPhone app and, like its iPad counterpart, works some behind the scenes magic to make the presentation show as it should on your iDevice screen. The iPhone app permits viewing and zooming of PowerPoint presentations, sharing and tracking of presentations, and connecting to projectors or TVs to blow those tiny presentations back up to audience size. With a SlideShark account, you can also store and access the presentations in the cloud at SlideShark’s site. You can also set auto-play functions to loop your presentation and can utilize a laser-pointer effect during presentations. All in all, Slideshark is a handy tool if you are on the road and needing to work with presentations. There are those out there claiming that good grammar is outdated. And then there are those out there looking to turn a buck helping you fix your grammar and proofread your opus (opuses? opera?). Should you choose to pay attention to your grammar, you can turn to the online service Grammarly to afford you that second set of eyes. Grammarly doesn’t beat around the bush: the site proudly proclaims it to be “The World’s Most Accurate Grammar Checker.” Grammarly offers both online checking and integration with your local software – Microsoft Office Word, PowerPoint, Outlook, etc. Grammarly checks for spelling, punctuation, and simple grammar checking, as well as highlights potential plagiaristic moments in your missive. Grammatical errors are indicated in red and clicking on the error will reveal a pop up card explaining the wrong and the “write” of it. You can choose to “see less” of the explanation in the cards, and there are up and down buttons to give feedback on the feedback that is given to you in the card. Word from reviewers is that Grammarly is near the top of the class when it comes to online grammar support, but that it falls a bit short as a local add-on, with much better options out there in WhiteSmoke or Writer’s Workbench. The other downside for me was a monthly subscription cost. For on-line, I would prefer a one-off option for the occasional support, rather than be required to pump in $20 or so bucks a month for a slightly better editor and checker than my word processor provides. That said, those who make their living writing, or students whose grades depend upon quality written product, might find the money well spent. It’s always nice to have another tool to fit in you writer’s tool belt. Ubiquitous Microsoft’s PowerPoint software has become synonymous with “slide deck”, much like Coke and Kleenex have become synonymous with cola and tissue. But maybe you aren’t fond of PowerPoint, or are simply interested in trying something new for creating your visual aids. Check out some of the web alternatives highlighted by ReadWriteWeb here. I am familiar with Prezi and Zoho Show and have used Google Docs Presentations with much success, but SlideRocket and 280 Slides are new to me. One ore more of these tools may better address the way you work. Some, such as Google Docs Presentations, allow for easy collaboration. Zoho Show incorporates live chat with your presentation audience. Check these out – many of them allow importing into PowerPoint so that you can bail and return to more familiar territory. Do Your PowerPoint Presentations Need Help? I am by no means a whiz at crafting PowerPoint presentations. I know enough graphics, layout and the basic rudiments of working in PowerPoint to struggle through the creation of a serviceable deck. However, it takes me a great deal of time and, with time being money and all, it gets expensive, if you catch my drift. Enter Jazz Presentations (link here). This site is all about PowerPoint. In addition to a wealth of “how to” blog posts that give great information for the do-it-yourself crowd, Jazz also offers very affordable PowerPoint templates that take much of the labor out of the process. Jazz also has a slew of great HTML email templates too – very visually appealing and professional. Their pricing is great, mostly less than the cost of a WordPress theme. Save Me From A Corrupt File! C’mon, you KNOW it has happened to you. Work for hours on an important document and then BLAM! run right into a corrupt file issue. You can’t save it, you can’t open it. It’s virtually worthless and you have to do the entire thing over again, right? Wrong. Enter Corrupt Office Text Extractor (link here) – a free web tool that will pull all the text out of your corrupt Office 2007 or later file so you at least can still access and use the meat of your document. Simply upload your document into the site, run it through the process and get your text back. Beware – the site is loaded with cautionary language as it is not yet certified as secure, so keep you sensitive documents to yourself on this one. The developer, Paul Pruitt, kindly points the secure document owner to various freeware available for download that essentially accomplishes the same task locally. While there is very effective paid software out there to manage this task, Corrupt Office Text Extractor may still have a place in your tool belt – the place reserved for immediate, free fix of a non-sensitive corrupt file. Thanks Paul! Have you been waiting for Microsoft to finally put its Office applications into the cloud? Have you been waiting for Microsoft to put a “free” tag on those apps? Well, your time has come. 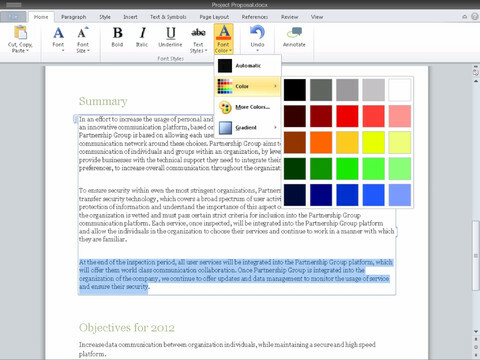 Office Web Apps, MS’ free online version of its Office suite, is now live on SkyDrive and available for U.S., U.K., Ireland and Canada-based users. With the simple creation of a Windows Live account, you can start playing with the new tools. You will find browser-based versions of Word, Excel, PowerPoint and even OneNote that mimic much of the look and function of their desktop sibilings. Silverlight improves some of the experience (such as uploading multiple docs at the same time), but is unnecessary. All modern browsers will work with the tools. It’s not the desktop experience, for sure. But it meets Google Docs head on. You can upload (drag and drop! ), collaborate with others, create within the web environment, print right from the browser and read docs on your smart phone. And, if you have Office 2010 installed locally (releasing next week), the web counterparts really sparkle with a seamless desktop / web experience. With 25GB of free storage on SkyDrive, this combination of features is nothing to sneeze at. The Windows team is also promising lots of Office features will be integrated into Hotmail, so stay tuned to that. Check out The Window Blog (link here) for more information and screenshots. All Hail the Cloud! There is nothing quite like the immediacy of real-time conversation about your presentation while the presentation is going on! This is particularly true if your presentation is about the power of social media. I found this great tutorial on how to create such a back channel for your next presentation. 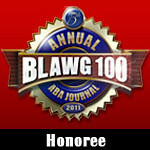 The website is called “140 Learning” and the topic is “Incorporating a Back channel in a Presentation” (link here). The article presumes your use of Powerpoint, Keynote or Sliderocket in your talk. It is relatively short but quite comprehensive and impressive, discussing issues that range from how to create a hashtag prior to the presentation to how to encourage dialog, from tools for easily adding your own postings during the presentation to ways to encourage dialog, from how to show the Twitter stream to how to invite feedback after the presentation. There is a lot of other great stuff in this article, so I highly encourage you to hit the jump if you are considering adding such a high-tech feature to your next presentation! If you are interested in sprucing up your presentations generally, check out Ray Ward’s suggestions over at the (new) legal writer on better Powerpoint presentations (link here). Thanks Ray!